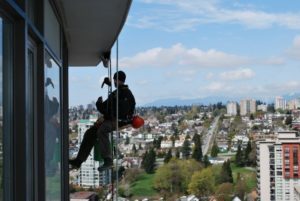 Ever Wondered How Window Cleaning Is Done On High Rises? Window cleaning is certainly not a job for those with a fear of heights. Even less so when working on some of Vancouver’s tallest residential buildings and offices. When it comes to cleaning windows on any building over one or two stories high, we break out our special technology and techniques. High rise window cleaning is not for amateur window cleaners. It takes years of training and on the job experience to be able to safely and effectively clean windows at height. When hiring people to perform window cleaning on your high rise building, we’d recommend checking they have the right experience, and most importantly, that they’re insured, up to date with WCB, and that they prepare Fall Protection Plans. All of our IMAGINE team are fully insured to give our clients peace of mind. Our window cleaning teams have years of high rise window cleaning experience under their belt. There are two methods of window cleaning they use when cleaning tall buildings. 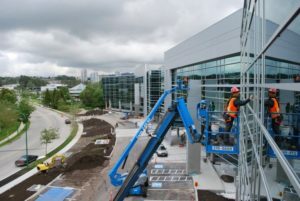 For buildings with several floors, an aerial lift (or boom lift) can be a useful piece of equipment. The platform provides space for all the necessary cleaning equipment and the barriers provide security. We can arrange appointments outside of core business hours so not to inconvenience office staff, or during the daytime for residential buildings so not to wake or disrupt people in their homes. When there is no room for a crane at the base of a building, we use ropes. For tall buildings with an easily accessible roof, we can rig up a rope system at the top, and abseil down to each floor. Not only does this method give our team a great view of the area, but it also allows them to stay close to the work area which means they can reach all corners of the windows. Whether we’re using ropes or a boom lift, or even by ladder, it’s important to make sure building residents know when we are visiting so that they can close windows to avoid water entering the home or office, and so they don’t get startled. We would generally recommend that property managers or landlords give their tenants a minimum of a week’s notice. To get a quote or schedule in your next window cleaning appointment, call us at (888) 835-0008 or send us a message and we’ll be in touch shortly.